Much thanks to the social media folks at MoMath for tweeting/facebooking my last combinatorics post! Welcome any new math-loving readers! You will probably not be interested in this post, but there’s a chance you might be! My in-laws got me a BEAUTIFUL red KitchenAid stand mixer for the wedding and I LOVE it. It also matches our new food processor (loaned for at least the next three years to me by my incredible maid of honor/wedding photographer), which I also LOVE. Since getting the stand mixer, I’ve gotten into the habit of breakfast baking if I’m up at least an hour before I need to get out the door. 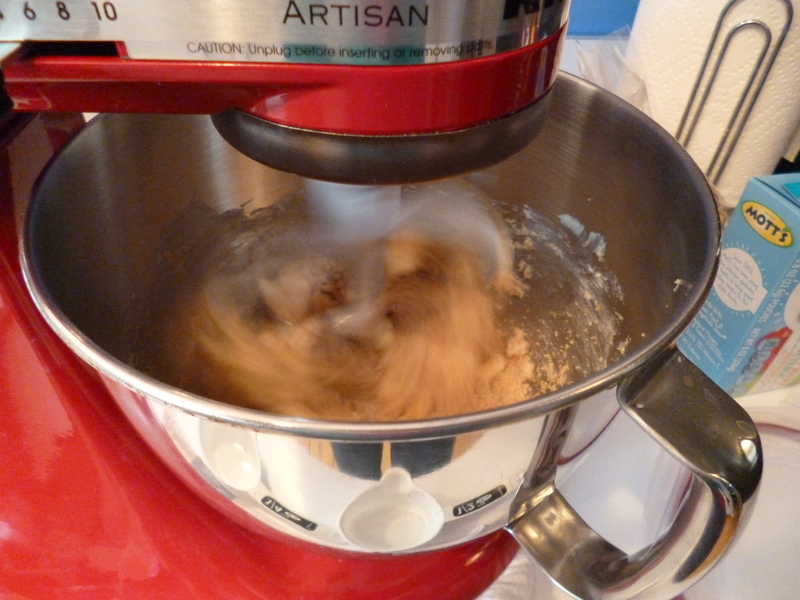 That is, I put ingredients in the mixer and turn it on, then start making breakfast, and do both simultaneously. I can eat my hot meal (hashbrowns, bacon, eggs, lots of fun lately) while the cookies bake, then clean up both afterwards before heading off to the office. 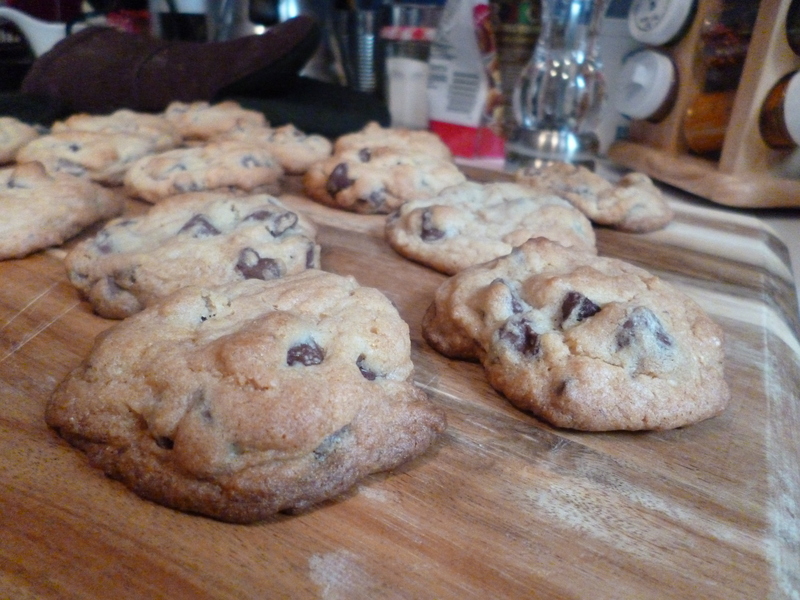 Two weeks ago I made these salted chocolate chip cookies, and I liked them so much that I made them the next week as well! 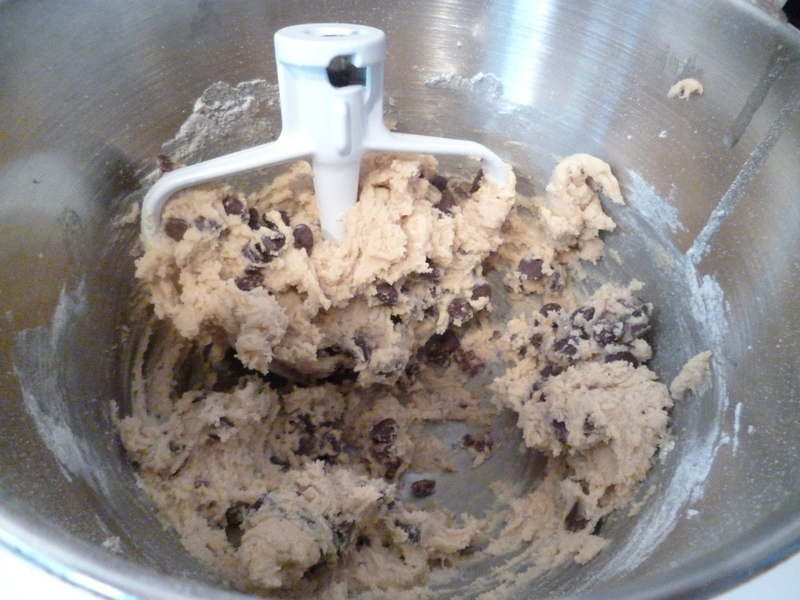 The first batch was awesome, but a few of the cookies had a strange taste on the bottoms. My adviser tried the cookies, and immediately said “stop putting your silpats in the dishwasher.” I was amazed that he knew what silpats are, and gave me advice on using them. 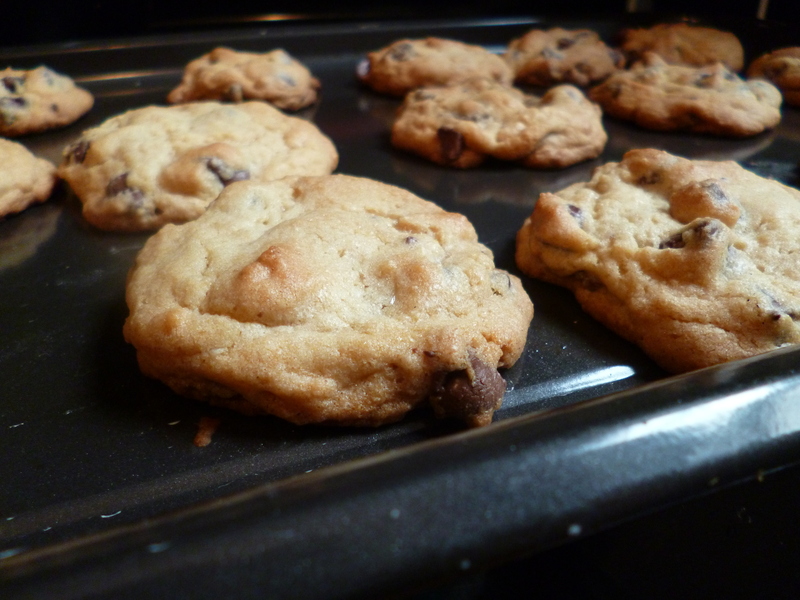 (I suppose he is my adviser, and so can advise me…) The point of this story is that I’m not using my silpats with cookies anymore, just going right on the ungreased baking sheet- cookies don’t make too much mess anyway. Not a very loquacious bunch here- all I heard was a couple of “Can Is Terse”. 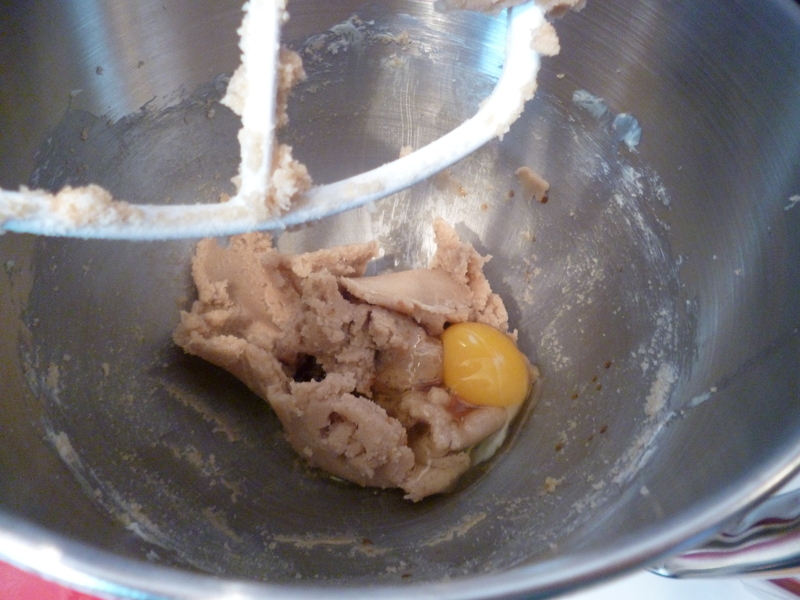 First, you cream the butter and sugars. I’ve been buying pounds of butter and freezing them, and have spent a bit of time experimenting with the best way to get them to soften. Of course the best is to put them out a day before you want to use them, but who plans to bake? After a lot of microwaving on random powers and at various times, I’ve decided that easiest is best here: 30 seconds on high. You might still have some frozen chunks, but if you’ve got the stand mixer that doesn’t really matter. Also, this recipe (link below) is SUPER METICULOUS. I am not super meticulous and it still turned out delicious! 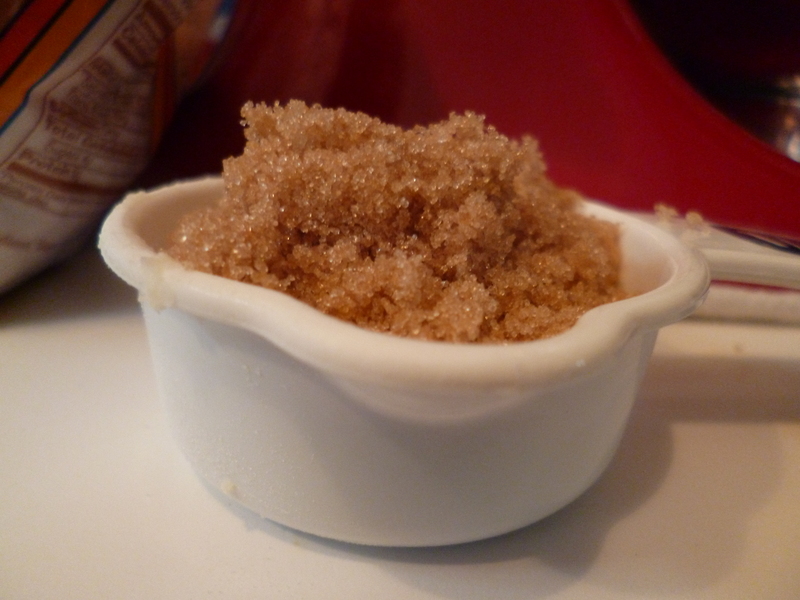 For instance, 1/4 c packed brown sugar is like, a heap over 1/4 c *not* packed brown sugar, right? 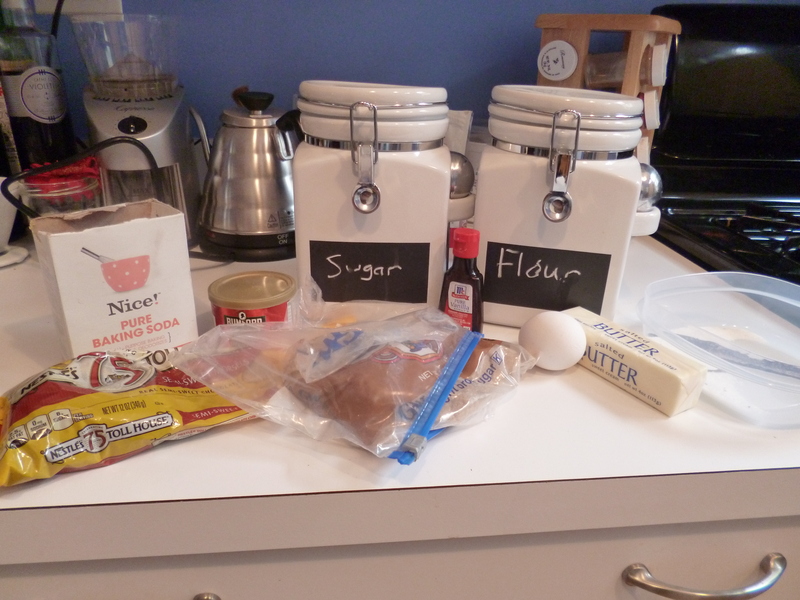 He eats a lot of fruit, but my husband doesn’t pack the sugar down. Oh well, at least we don’t have ghosts running around our house trying to kill us. (This is a long reference to Pac-Man if you didn’t get it). Okay enough with the jokes. Toss in an egg and vanilla, beat again, then toss in the dry ingredients. No more puns? Yeah right, Yen. Even under eggstreme conditions I can’t avoid them. What sort of conditions? Things I can’t handle? The key to these cookies is SALT. I normally don’t add salt to my baked goods (I use salted butter and have never noticed a huge difference), but the SALT makes these cookies incredible. I used leftover vanilla salt from the wedding favors, though coarse sea salt would also work. 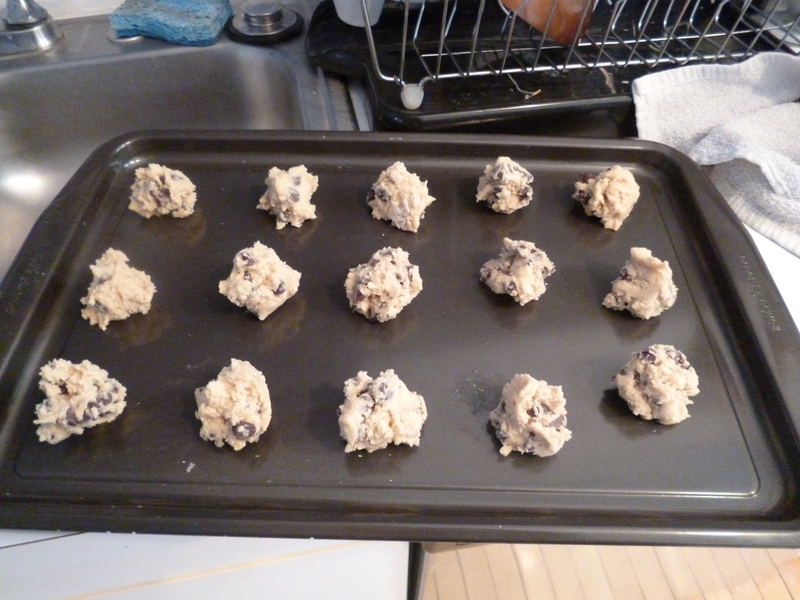 Drop onto a cookie sheet and bake for 12 minutes while you eat breakfast! I warn you: the recipe is VERY METICULOUS. She uses timing. I assure you, you don’t have to leave the cookies on the sheet for exactly 2 minutes, then remove and let cool on paper for 3 minutes. They’re still delicious. Here’s another glamour shot, this time on one of our new cutting boards. Really I’m just trying to show off all our new kitchen equipment in this post. 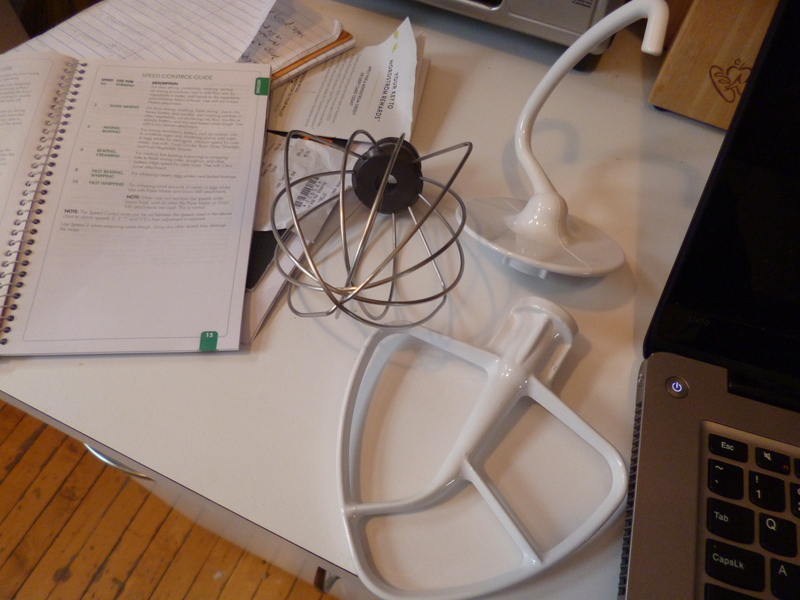 We have a grating attachment for our mixer instead of a food processor (though I want a food processor again when we move to a place with a bigger kitchen), and I have to look at the manual every single time I use it because it’s so hard to remember how to put it together and take it apart. It’s highly non-commutative, and I just have trouble with that.